As a surgeon, you face a unique set of challenges other professions do not: You’ve got to be on call and you work unpredictable hours, which means the need to work at night is an essential part of the job. But night work means you’re fighting to stay awake when your body is physiologically programmed to sleep—no matter how much coffee you drink or how much sleep you get during the day. Working at night increases your sleep debt, and working when most people are asleep can have effects on your health and can possibly impact your ability to care for patients. In the United States, where it is accepted and expected to “always be on,” the study unsurprisingly found surgeons worked far more hours than those in European countries. As you can imagine, this can take a toll on you physically and mentally. These extended work hours, combined with a workload of 50+ hours per week can—and often do, according to Amrian’s research—cause chronic sleep deprivation. Night work combined with these extended hours affected patient safety and physician health through increased risk of percutaneous injury. This may seem obvious, but an essential part of maintaining health and reducing night-shift fatigue is to establish a solid sleep routine. To do this, make sure your bedroom is a suitable place for sleep. That means trying to avoid watching TV, using mobile devices, or playing videos in your bedroom. When sleeping at home, always try to sleep in your bed and avoid using a couch or chair as a place to sleep. Try to follow a similar eating pattern during night-shift work that you would during the day. Remember to eat and drink enough so you are not starting your shift hungry or thirsty. It is easy to miss regular meals when working at night because your circadian rhythms can affect appetite, and it is a time when most dining establishments are closed. 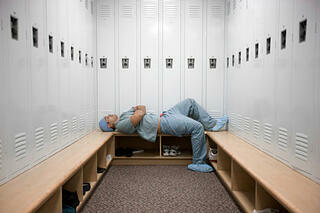 When your night shifts are finished, be sure to catch up on your sleep by going to bed as soon as you get home.